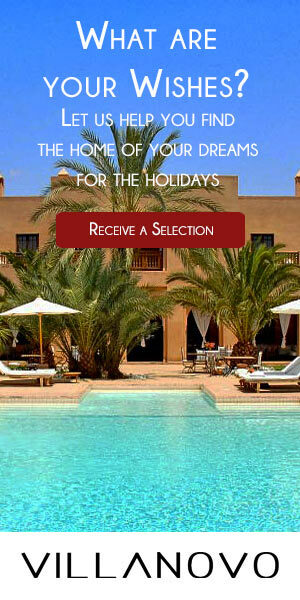 Villanovo offers you a very nice selection of villas in Oualidia (La Diouana, Villa El Manzar, Villa Lagon). Pretty seaside resort, Oualidia is ideally located between Casablanca, Marrakech and Essaouira, and is close to the city of Safi. Out of season and the week, the town is quiet and quite wild. She wakes up at weekends and during holidays with foreign tourists but especially with city dwellers looking for sun and beaches. You will have the opportunity to vary the fun of swimming, Oualidia has two coasts: the wild of the ocean for water sports and gliding, it is perfect, and the calmer bay that allows the culture of seafood to be celebrated throughout the world (the famous oysters of Oualidia). The gastronomy of the city, thanks to the aquaculture of oysters and other shells, have given a great fame to the city. We come to Oualidia for seafood platters, sea urchin tasting, barbecues improvised on the beach where grilled fish and seafood sprinkled with fresh lemon and cooked directly with sea water awaken the taste buds. Many restaurants will be stopovers during your stay. The best known is certainly the Gourmet Spider, perhaps the first seafood restaurant in the bay. But you will have the choice today between the restaurant of the 5-star Sultana Oualidia hotel, the Hippocampe, Dar Beldi's table, the Initiale, the Oualidia Dream Inn (paella specialty) and the tasting of oysters on the outskirts of the oyster farm, Ostrea II.